Atletico Madrid scraped past Bayer Leverkusen at the Vincente Calderon to make it into the Champions League quarter-finals. Just like the first leg, it was a tight affair played between two teams that revolve their play around intense pressing and quick transitions. Both teams lined up pretty much to expectation both in personel and shape. Godin, Tiago, Niguez and Siquera were unavailable for Atleti through injury as was Jedvaj for Leverkusen. 4-4-2 for Atletico, situationally a 4-4-1-1 as Griezmann dropped behind Mandzukic. 4-2-3-1 for Bayer Leverkusen which changed to 4-4-2 later on in the match with Kiessling and Bellarabi up front. Oblak came on for Moya after 23 minutes due to injury. Both of these teams like to condense the match into a small space and at times every player was within three of the five vertical columns. 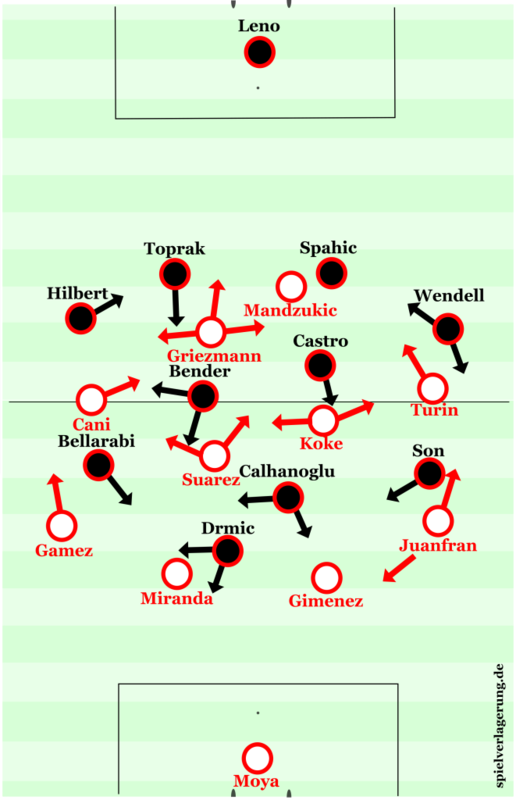 When Bayer Leverkusen had the ball in the flank in the middle third, the Atleti wide midfielder on the opposite side would tuck in narrowly, slighlty ahead of Atleti’s other three midfielders to prevent a switch. Bayer Leverkusen also played very narrowly when Atletico had the ball in the middle third. Their back four would adopt a narrow bowl shape during Atleti first and second phase build-up to condense the game and stay closer to the Atleti wide midfielders who tend not to position themselves so highly. They also played in this narrow bowl-shape at times during Leverkusen possession around the centre of the pitch. This was presumably to allow them to counterpress more effectively however they didn’t commit themselves to pressing or counter-pressing than they normally do. Most of Leverkusen’s play was oriented around long balls up to Drmic. 41 of Leno’s 50 passes were long balls. Spreading the CB’s and building up expansively would have put them at a risk in the defensive transition, a risk not worth taking considering they were 1-0 up on aggregate. The selection of Drmic was an interesting one, especially considering Leverkusen’s long ball game. I imagine the reason he was picked was for his pace on the counter attack, as Schmidt probably expected most of the game to be played in Bayer’s own half. They never really made use of this as Drmic didn’t make a single shot or dribble in the 68 minutes he played before being replaced by Kiessling. I had the pleasure to watch and analyse a fantastic defensive performance last week and Atleti’s was of a similar vein however they made life difficult for their opponents in all thirds of the pitch. Griezmann and Mandzukic pressed Bayer’s centre-backs with intensity, with Griezmann also helping the wingers in pressing Leverkusen’s full-backs. Leverkusen often struggled to get the ball from first to second phase of build-up due to this pressing as building up through wide areas was difficult, as well as not being able to get the ball to their double pivot as Griezmann and Mandzukic’s pressing often cover-shadowed their double pivot who played square to the CBs. When Leverkusen had the ball in the middle third, they failed to switch play with any pace when an opportunity arose. This allowed Atleti’s narrow defensive block to shift. Mario Suarez would be slighlty deeper than Atleti’s other three midfielders, marshalling the space in between the lines that Calhanoglu occupied. Atletico also stuck tight to Son and Bellarabi, therefore nullifying Leverkusen’s three most creative influences. Neither Son or Bellarabi made a ‘key pass’ all match with Calhanoglu only playing one. Atletico were also impressive when defending in their own first third. Miranda and Gimenez were particularly good making 9 interceptions between them as well as tracking Drmic’s runs well while not being pulled out of position due to his good movement. Atletico were mostly ball-oriented, shifting up and down the pitch and left to right depending on the position of the ball. They played with two deep, close together lines of four when defending in their own third which caused Leverkusen to look fairly clueless in the final third as they are team that normally thrives on quick combinations in between the lines to penetrate the opposition defence. Griezmann was fantastic. He was at the heart of Atleti’s attacking play throughout the whole match. He would stand close to the touchline (usually on the left) during Atletico’s early build-up. Which would stretch Leverkusen’s defence while meaning that Atleti’s wide midfielder could contribute more in the build-up and drop deeper and more centrally, helping to overload midfield areas. He also dropped into deeper central positions and played off Mandzukic, a proficient hold-up player. This would often not be too beneficial as Bayer Leverkusen played with quite a high block during Atleti’s early build-up which meant that there were times when through balls would be played for Mandzukic but he wouldn’t have the pace to run behind Leverkusen’s defence onto goal. Despite this, he often made horizontal runs, opening up space centrally for Griezmann to run into and be met with a pass. A better strategy for sure. 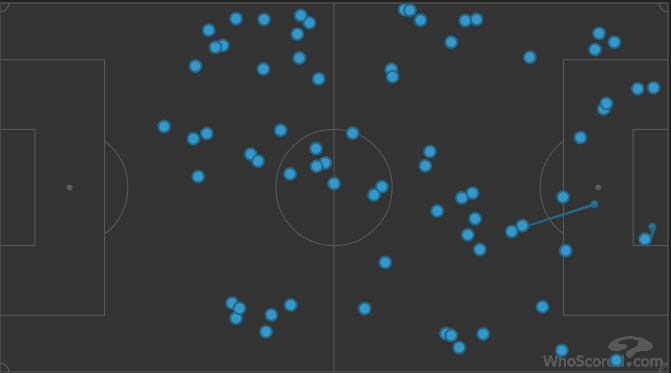 Griezmann touchmap. He was everywhere. Raul Garcia came on at half-time for Cani and played right-midfield, with Turan switching to left-midfield. He was used as an aerial outlet, almost a wide targetman vs 5’9″ Wendell at left-back. Wendell didn’t win a single aerial duel all match and only one of his 60 passes were with his head. Garcia and Mandzukic were both effective targetmen, 13/34 of Garcia’s passes were with his head. This figure was 15/31 for Mandzukic. One negative of Garcia at RM was the fact that Wendell was the most advanced of Leverkusen’s fullbacks. Garcia didn’t have the pace to exploit the space that was left behind him. Atletico are the kings of the corner kick and they put into place an interesting tactic. They knew that Leverkusen mark man-to-man when defending corner kicks so Atletico put all their runners in Leverkusen’s six-yard area. This would leave a lot of space in and around the penalty area where normally Suarez, Cani and Turan were positioned to collect the ball when it was clear. This was a very tightly matched tie which resulted in Atletico Madrid winning a penalty shootout containing some of the worst penalty kicks I have seen. Leverkusen were deserving winners in the BayArena and Atleti were the better team in Madrid. I don’t think Atletico will go as far as they did last season and will struggle to get past a more seasoned Champions League side such as Barcelona or Bayern Munich. I don’t think Roger Schmidt will be too unhappy with Leverkusen’s European campaign this season. I think if they continue to play with the same intensity while also ironing out some of their defensive issues, they could punch above their weight to a greater extent in the Champions League next season if they can qualify.